Top Mounting Bracket for OGM Anchor and TriAnchor navigation lights. 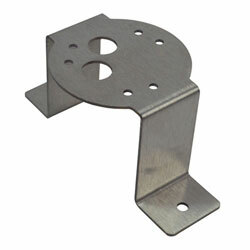 Mounting bracket designed to mount OGM LED TriAnchor and Anchor lights to the top of a mast or other flat surface. Multiple mounting holes allow rotation of bracket in various orientations. Constructed of 316 Stainless Steel. Industry experts and avid boaters alike have chosen OGM's innovative, energy-efficient LED lights for their rugged construction, reliability and Features:. All lights are USCG Certified for 2 nautical miles and meet COLREGS '72 standard for boats up to 50 meters (165') for running lights, and sailboats up to 20 meters (65') for Anchor and TriAnchor lights. Each light is individually tested under water to assure waterproof performance. Integrated DC-DC power supply maintains consistent brightness over a wide operating voltage range. Anchor lights with photodiode automatically turn on at night and off in the morning. TriAnchor lights have Marine QuickFit Disconnect wiring for easy installation, winterizing or storage.